Is the Breeders' Cup the Black Friday of horse racing? Or is it like a birthday? Or is it like your favorite buffet? Or the holidays? New Year's? Or maybe the Breeders' Cup is sewn with threads from all of them. Well, at least for horse players. Like Black Friday, each race has horses that you have your eye on; the long shot that nobody knows why it's going to win except you. The four is a bargain at whatever odds. So, you can't wait, you're itching to take advantage of that deal. Or like your birthday, you never know what you are going to get. Oh sure, you've got ideas that are floating around in your head, envisioning the race's end and your horses passing the wire, in vivid, slow-mo HD, perfectly matching your ticket. Ah, but like unwrapping that gift box, when the starter's gun goes off, you don't know what you've got until you see it - some more underwear and socks or that thing you've been kicking around in your mind. Or like a buffet, you've got so much to choose from. Is it pizza, or pasta, or seafood or... the choices are seemingly endless, and each has you salivating. You can taste it and you haven't even made it to the parking lot. With every race, you have front runners, closers, horse that can't make up their minds, international entries that you know nothing about but still whet the betting appetite. You want them all, but you're not sure what you should put on your plate first. They all look good, because they are. Black Friday came early this year for GTS as our 15-page Breeders' Cup Wagering Guide is complete and with a PRO monthly subscription, you get the full guide plus our full card picks for both days of the Breeders' Cup, all other tracks and races for a month PLUS our 54-page wagering guide on how to best play our picks! Purchase your PRO monthly package here. Last year's Breeders' Cup picks paid a combined $4,800.00! This year's opening Churchill Downs picks paid $3,837.60! Or like the holidays or New Year's. It must be the biggest two days of horse racing money wise. It's a festivity, a celebration of the best of horse racing. Everybody - or at least mostly everybody - is a good mood, naughty tickets of the year gone by are forgiven and there is hope, great hope of good things to come. And, a lot of people have a hangover that day after it's over, right? The Breeders' Cup Juvenile Turf Sprint is like when the doors swing open on Black Friday. It's the official kickoff to the holiday season and the mad rush of the best two days that horse racing has to offer. Anticipation is at its peak and deals abound. Bulletin (PP: 5 ML 10-1) has the look of a doorbuster. He started his career with a non-graded stakes win. No maiden special weight, no maiden claiming, he went straight to stakes racing and crushed them by seven in his debut. Whoa, whoa, whoa... wait a minute, So Perfect (PP: 10 ML 12-1) might be the steal of them all. She's coming from England and Ireland, information is scarce, so she is likely to be overlooked. Yet, she scored a third in a Grade 1 in her last race, missing by just 3/4s of a length. That was in a first start following a layoff. Surely, she'll improve in round two. The Juvenile Turf Sprint is a smorgasbord. The 12 horse field is loaded with five international flavors, mostly from England and France. Horses like Soldier's Call (PP: 2 ML 9/2) and Sergei Prokofiev (PP: 6-1) sure look good on paper but will they like their first taste of running in the US. Many horses struggle when crossing the Atlantic. Before the gates swing open and thundering hoofs pound the Churchill Downs' grass, this is how we see the Juvenile Turf Sprint playing out early in the race. Again, from our Breeders' Cup Wagering Guide. "STRIKE SILVER is likely to get the jump on the field from the rail. BULLETIN and SOLDIER'S CALL should be a step or two behind. MOONLIGHT ROMANCE would like to run in the shadows of the front runners, especially with a pack of stalkers waiting in tier two." "STRIKE SILVER got roughed up at the start in his last, coming from dead-last of 12 to win. SHANG SHANG SHANG has rung the bell in both of her races, including a nice Grade Two in England in her last. SOLDIER'S CALL has run Graded Stakes races in Europe against good competition. Comments suggest he'll run and rate and look to continue his perfect in-the-money streak for Graded Stakes races. SO PERFECT is another European horse who has rated well against quality opponents. She looks to stalk the leaders and pounce late." Hopefully, when The Breeders' Cup Juvenile Turf Sprint gift box is unwrapped and opened, we got what we wanted. Either way, the two-day horse racing party will just be getting started. 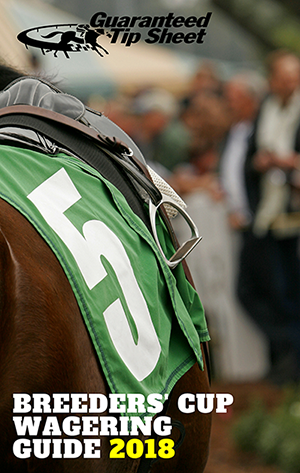 GET OUR COMPLETE BREEDERS' CUP WAGERING GUIDE!